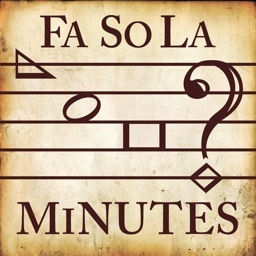 “FaSoLa Minutes” lets you browse and search the Minutes of Sacred Harp Singings. Click on the one of the shape notes labeled “Singers,” “Songs,” or “Singings” at the bottom of your screen to browse within that category. To search within a category, click on the associated label and then pull down on the list that appears to reveal a search bar. You can also click on the “Search” (mi) option to search all the data in the Minutes. When navigating through the app you can always click on the arrow in the top left corner of the screen to go back to the previous page or click on the label for the section of the site you’re browsing to go back to it’s home page. 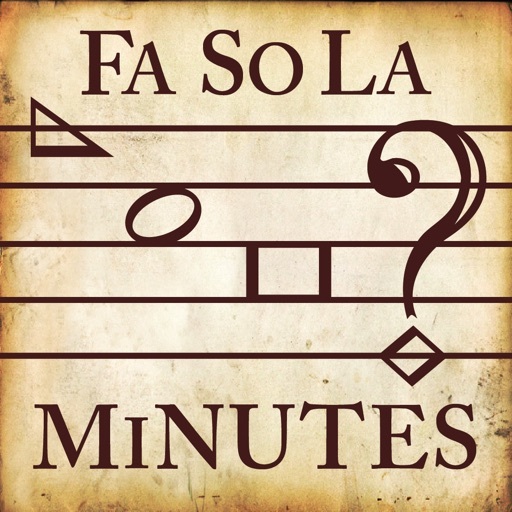 Read on for details on what each section of “FaSoLa Minutes” can do. 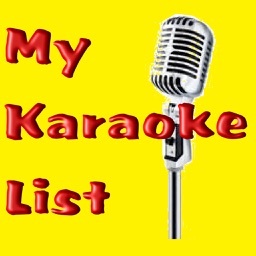 Click on “Singers” (fa) to pull up a list of singers who have led songs since 1995, sorted alphabetically by last name. Use the buttons in the top right corner to sort instead by song count (the number of songs a singer has led) or by entropy (a measure from 1 to 0 of a singer’s unpredictability when leading). From the search bar, type any part of a singer’s first or last name to call up a list of matches. Click on a singer’s name to bring up the singer’s number of songs led, number of times leading, and entropy number. 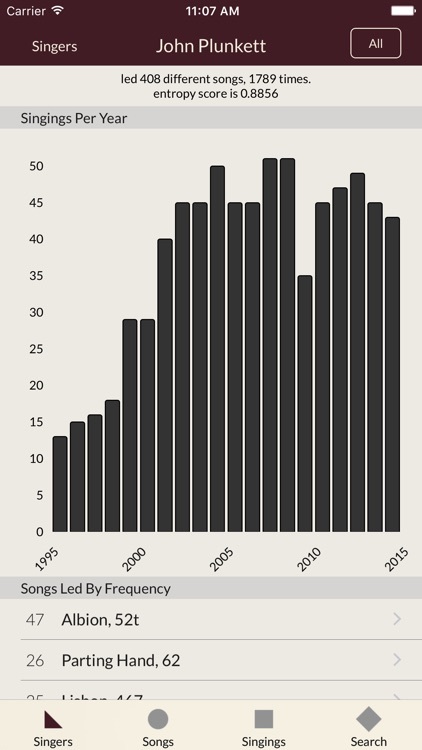 Beneath this information is a graph displaying the number of songs the singer has lead each year and a list of the songs they’ve led (in order of frequency) since 1995. Click on one of these song titles to view a list of the times the singer has led the song. Clicking on one of these instances takes you to the page for the singing. 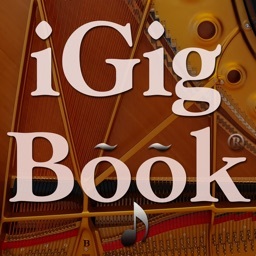 Click on the “All” button at the top right of the screen to view a chronological list of all the songs the singer has led as well as singings at which the singer has led them. Clicking on an entry brings up the page for that singing. 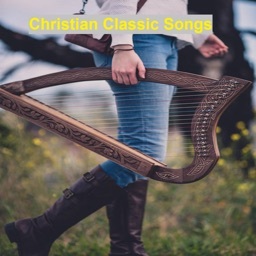 Click on “songs” (sol) to view a list of songs in order of their page number in The Sacred Harp, 1991 Edition. Click the “Count” button in the top right of the screen to sort by frequency of use, or pull down on the list to reveal a search bar at the top. You can use the field to search not only for a song’s title but for a word within the text of any song. 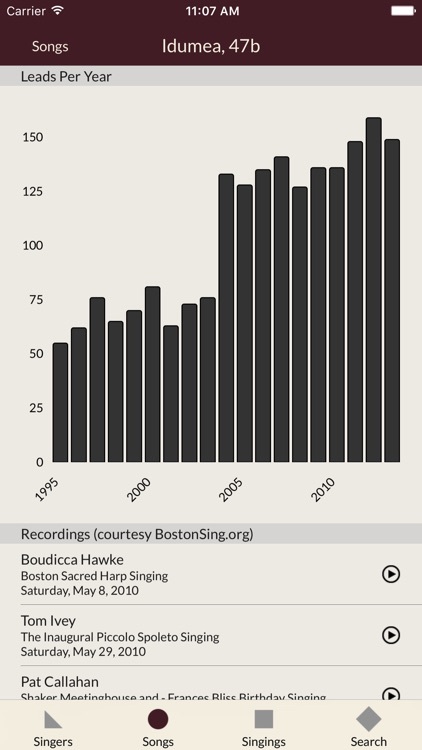 Click on a song to access its hymn text, view a graph of the song’s usage since 1995, and to see a list of its top leaders. You can also play recordings of the song if any are featured on the BostonSing.org website. Click on one of these singers’ names to view a list of the times the singer has led the song. Clicking on one of these instances takes you to the page for the singing. 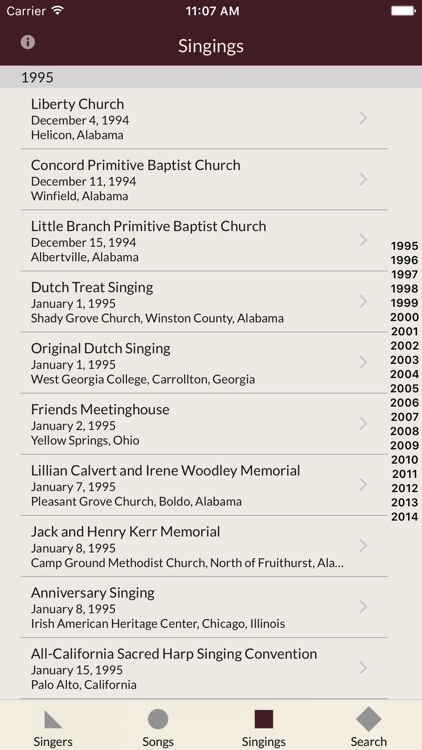 Click on “Singings” (la) to browse a chronological list of all singings from The Sacred Harp, 1991 Edition since 1995, along with their date and location. Use the search field to search for any part of a singing’s name or location. 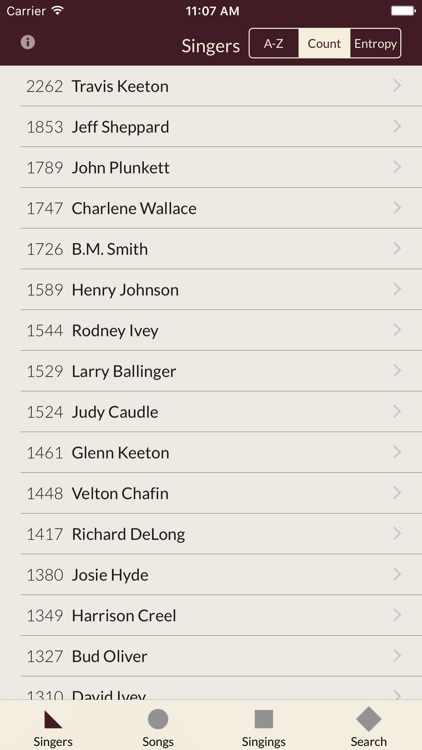 Click on a singing’s name to see how many leaders led at the singing and how many songs they led, along with a chronological list of the singing’s songs and leaders. 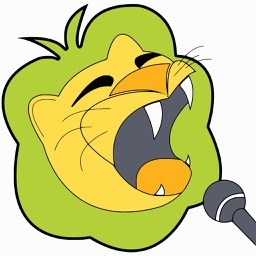 You can play recordings of the songs—when available—by clicking on the music icon toward the right of the entry for the song. Click on the name of the song or its leader to view the leader’s page. Click on the “Text” button to see the singing’s complete minutes. The Minutes of Sacred Harp Singings are graciously compiled and provided by the Sacred Harp Musical Heritage Association, a 501(c)(3) non-profit organization whose purpose is the preservation and perpetuation of Sacred Harp singing and its traditions. 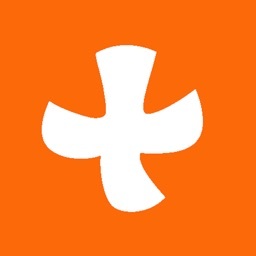 The developers of this app in no way personally profit from the sale of this app.